Shenanijam: A postmortem analysis. How it unrolled & lessons learned! I thought I’d do a postmortem analysis of my entry to the Shenanijam – a 48hrs jam organised by the Butterscotch Shenanigans indie studio. This was my first ever jam, and as I came to realise a huge undertaking when working solo! Overall, it was a very rewarding experience and I published my first game on itch.io thanks to it! Trailer below. You can also try the game here: https://mitron.itch.io. How did the jam unfold for me? how the caterpillar would move & look. After a short, restless night I started my first all day work binge. My “aha!” moment was 3-4 hours in, after I had the caterpillar animation & controls working. I had experimented with the caterpillar leaving a colour slime trail behind. Quite pleased with the effect I suddenly thought – wouldn’t it be cool to have not one, but several caterpillars, all fighting each other? Since caterpillars leave a trail of colours, could they fight like a 2D splatoon? Done. Each caterpillar would have their own colour, and melt when touching another colour. The rest was just relentless work until 11pm that night with little breaks in between. I added IA caterpillars, additional controls for up to 3 players (R, G & B! ), menus and eventually a single player mode. I went to bed satisfied, but exhausted. After a decent night of sleep I moved on to polishing the game. I focused on equipment for the caterpillars, dynamic menus (including help), sound effects, multiple levels for the single player mode, and some final touches. I spent the last 2-3 hours on the trailer, which included some animations (which I made in-game) and footage of the game – and voila! Post deadline everyone was able to further polish their games, so I spent an additional 3-4 hours polishing issues and responding to player’s feedback. Response was overall positive, which I was grateful for! 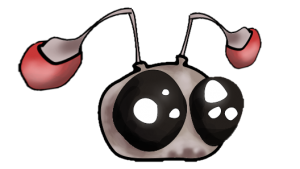 Caterpillars are able to wear masks, which give them individual boosts… Aim was to vary the gameplay! Postmortems are all about identifying issues – So what went south during the jam weekend? Well… Nothing much! I set my working hat on, focused and I think produced a pretty round, polished product within the time constraints – flashy trailer included. One thing I could have done better, is to have a precise concept in mind before setting off. 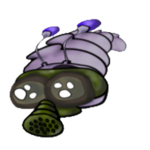 I was lucky that experimenting with my original idea gave me the concept of a splatoon-ish caterpillar death match – but I guess this is part of the jam way of things! Then I saw it: a handful of jammers (BIT3MUP) undertook the herculean task to play everyone’s game and stream the footage. Once they got to my game, I saw with my own eyes that the slime indeed did not reset on level restart. Shock horror, the slime surface was not clearing!!!!!!!!!!! I jumped in on discord the next day, and luckily one of the jammers was happy to test my patches (shout out to Sahaun!!). After a couple of iterations, my game was bug free, however this was quite late in the scoring process – only one day left. 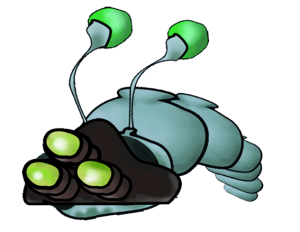 This is what a dead caterpillar looks like in the game… They can still move (bug) but not shoot! Postmortems are also about patting yourself on the shoulder! Here are some positives: Itch.io is a great platform and I seriously enjoyed the community response. 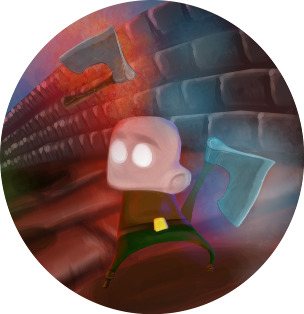 Fellow jammers responded positively to the game, and some of the feedback was incredibly useful to improve the game. I really enjoyed that the rules of the Jam allowed you to polish up the game post submission deadline. An example of useful feedback? This was a big oversight on my part considering my game mechanic was based around colours, but RGB was a poor choice of colour. One of the jammers reported he could not play the game because he was red/green colour blind. After a few corrections and a couple of iterations I added in a “funky colour” mode, which he was able to play. I found the extra few hours polishing the game were worth it. The feedback/polish phase felt very rewarding, and overall made the jam a great, satisfying experience for me. – Play test: If you can, prior to embarking on the jam arrange for a few friends to test the game for you & provide feedback over the jam! Having someone test the game on another PC might even have brought up that surface issue. Also – especially when working solo, it’s difficult to gauge how fun & balanced the game actually is, when you’re up to your neck working on it. – International Audience: I received one comment about the controls being a bit cramped together. I am not 100% sure what was meant by this, but it got me thinking about keyboard input. My game currently uses a combination of keys that probably only work on QWERTY keyboard, which might not work in every country and make the game impossible to play for some! Definitely something I’ll look at adjusting. 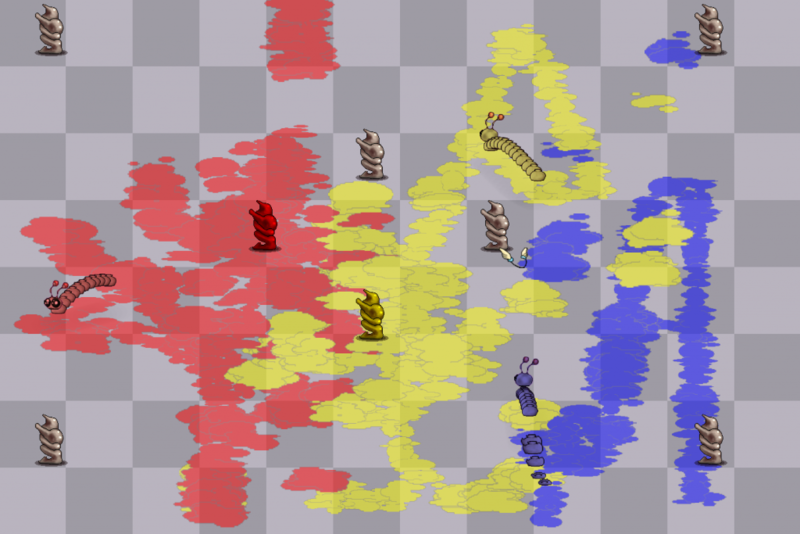 Green is replaced by Yellow and caterpillar colours are pumped up in colour blind mode – makes a huge difference for players that suffer from Deuteranope or Protanope. Rating is over by the time I write this post, and Melt ‘Them All came in 23rd place. Of course, I am a bit disappointed! But I also appreciate some very good games came out of the jam and getting to the top would have been difficult. I really like the games that made it to the top 10 – they’re very good! Let’s take a closer look at the scores and see what we can learn from the experience. Big surprise, I got a high score for replay-ability. I guess Jam games don’t normally come with both single and multiplayer mode and this obviously went in my favour. Now – did I spread myself too thin, and should I have focused on single player? Let’s look at the other scores. On the opposite side of the scale, Weirdness. Butterscotch Shenanigans love quirky games and this was one of the voting criteria. I guess my game looked too conventional, but I’ll admit I didn’t take any particular steps to do otherwise, which reflects in the score. I think the game was too much like a clone snake to carry any weight in this area. Balance and Fun are relatively average. I’m not too sure how to take this reading. Quite a few people commented the game was fun; I assume others disliked it. I can’t quantify how many ran into the surface bug highlighted earlier either, so there’s a chance a few people ran into that problem and that it impacted my score. Polish – I felt the game was a pretty finished product: menus, several modes, nice trailer. One issue though: the single player was put together rather quickly. Back to my comment on spreading myself too thin by having multiplayer etc. Most people wouldn’t have had buddies to play multiplayer, so spending little time balancing multiplayer, probably impacted my overall score negatively. 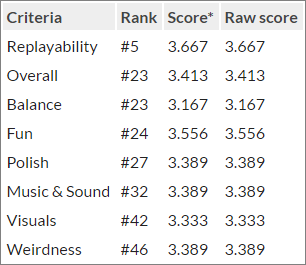 Sound: Not a great score, but I barely spent any time on this. The music was from the Free Music Archive and I used the same artist Butterscotch Shenanigans used for their music for Flop Rocket. Sound was done with BFXR, which always sounds a bit arcady (and probably got on people’s nerves!). Finally: Visuals. I scored poorly on this unfortunately. Although the caterpillars ended pretty cute, I didn’t have time to work on the background and opted for a grey scale chess board. This definitely made the game look rather basic and is likely the reason for the low score. Spend more time on graphics, or even pair up with an artist next time?! In continuity with that last point, give single player more attention. I could have developed the solo game a bit more, and maybe turned it into some sort of puzzler? Weirdness – if this is a metric on the next jam, embrace it and go wild! And don’t forget – you can check out the game on https://mitron.itch.io!!!!!!!! Shenanijam Postmortem - StickAss, my 2018 entry!